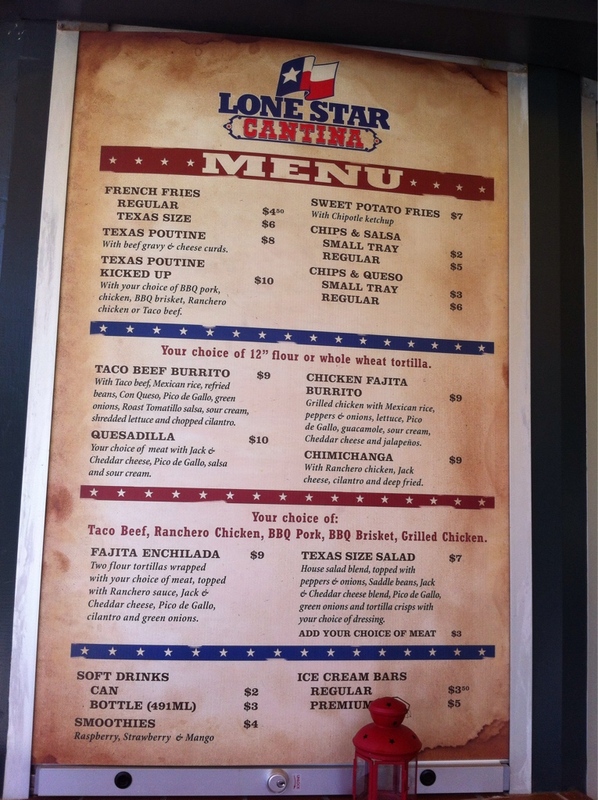 Weighty Matters: A 4th of July Reflection - Is Junk Food Part of America's National Heritage? 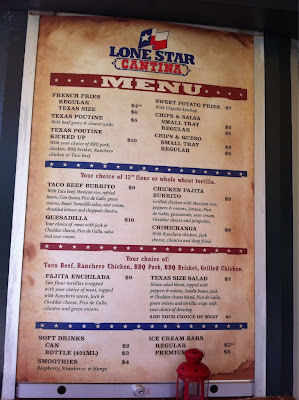 A 4th of July Reflection - Is Junk Food Part of America's National Heritage? This past weekend we took our 3 little girls to Hog's Back park. It's all at once a lock station, water control dam, retaining dam and lookout point, and it's been part of Canada since the Rideau Canal was opened way back in 1832. It's beautiful and it's maintained by Parks Canada. 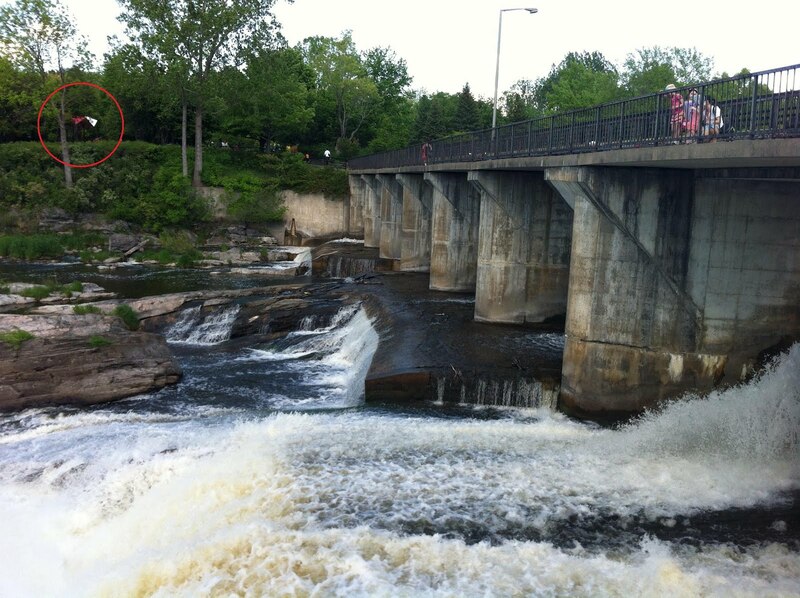 In that picture up above you can see my kids and wife looking down over the falls, but what's in that red circle that I've highlighted nestled among the trees? Nary a healthy choice to be had. But this post isn't really about Hog's Back, or Parks Canada, or Lone Star. It's about hypocrisy, duplication and inaction. "the settings in which we live, learn, work and play, which can influence the choices we make including the food we consume"
"minimizing the factors that contribute to obesity during childhood"
Is it all just feel good blather? 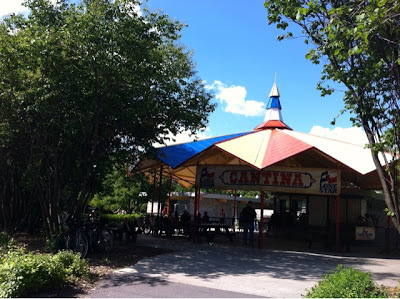 If our federal, provincial or municipal governments truly wanted to start improving our children's environments and setting a leadership example for change would chimichangas really be sold in one of Canada's National Heritage Sites? Similarly, if change were really on the menu, would our schools, hospitals, arenas and community centres still be selling no name junk food? Wouldn't we be seeing a much larger investment in water fountains, farm to table programs, cooking skills classes and caloric literacy? I know I'm a broken record, but we don't need more talking. Back in 2006 the House's Standing Committee on Health, over the course of eight months, heard hours and hours worth of testimony (including mine) which in turned helped to shape their March 2007 report Healthy Weights Healthy Kids. How much expert testimony and consideration did the Committee hear? By my count, over eight months they heard from 111 different experts representing 65 different public and private institutions whose reports the Committee then summarized in a formal 60 page report with 42 explicit recommendations. Does anyone think that the science has change dramatically over the course of the past 5 years? Were 111 different experts too few? Why are we duplicating an extensive 2007 federal effort at not one, not two but rather three different levels of government and why are we paying for that effort's recurrent duplication? Let's finally stop talking and start doing and at the very least someone please get the damn chimichangas out of our park! And please don't talk to me about the importance of giving people "choices". The world is full of them, that's not changing, people will have plenty of horrible choices to choose from - but when it comes to our publicly funded institutions, the only choice should be health.